Seedlings tolerate light frosts, but plants are killed by freezing temperatures. Dill, Agastache and Echinacea. Tall varieties can form a colorful hedge that attracts bees and other pollinators, and mix well with tall herbs like dill and fennel. 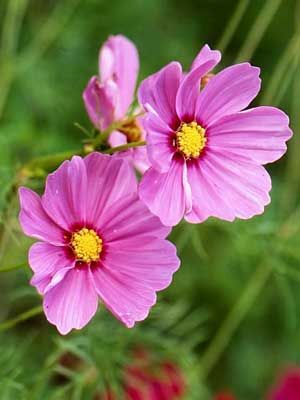 Sow cosmos in early spring so the plants can become established before hot weather comes. Cosmos also can be started indoors in containers and set out when the seedlings have at least five leaves, or purchased as bedding plants. Plant seeds in prepared soil about 2 inches (5 cm) apart and one-half inch (1 cm) deep. Thin to 8 inches (20 cm) apart in all directions for dwarf varieties; allow 12 inches (30 cm) between very tall varieties. Varieties vary greatly in height, color and flower form. Choose dwarf varieties for tight spaces. Sulphur cosmos (C. sulphureus) thrives in humid heat. Cosmos make good cut flowers. Pull up the plants and compost them when blooms become few or freezing weather is expected. In some climates, cosmos planted in spring may not come into full bloom until days become short in early autumn.